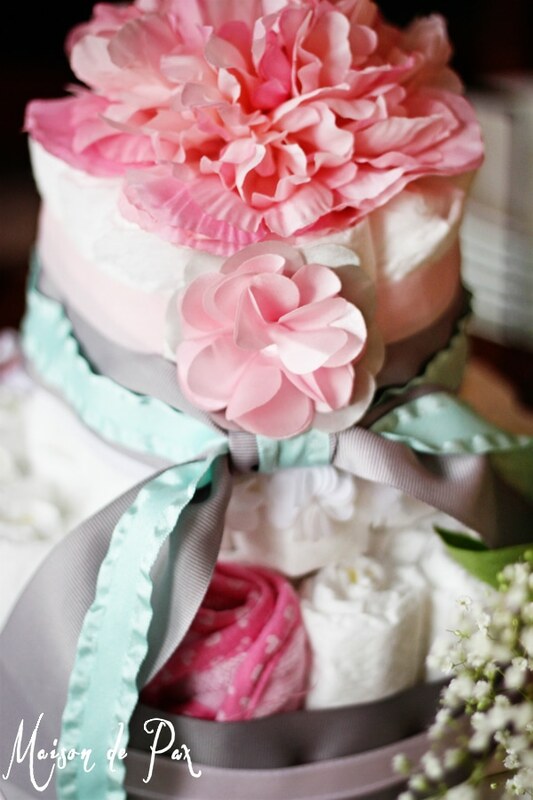 This is the fourth or fifth diaper cake I’ve made, and before I share a step-by-step tutorial, I want to tell you three reasons why I think diaper cakes are awesome (ok, maybe that’s a stretch) perfect for a baby shower. Since it is a gift as well as decoration, it’s about the cheapest centerpiece you’ll ever make. You can make a stunning cake for ~$5 beyond the cost of the actual gifts. It’s easy to personalize to the colors or theme of the shower. Saving time, money, and headache? Yes, please! Notice how the only cost beyond registry items and diapers (which we all know babies need!) are rubberbands, ribbons, and a flower. Use a 40% off coupon and/or hit a sale, and you’re really set. The larger sizes for diapers and onesies allows the mother to keep the diaper cake in the nursery for a while if she wants to, foregoing the need to disassemble merely to use the contents before baby outgrows them! Tier 1: Stand your tall lotion or bath wash bottle in front of you and put two rubber bands around the bottom. Leaving the diaper folded (like it comes out of the box), roll the diaper so the top is hidden and place it in the rubber band. Continue to add diapers into both rubber bands all the way around the bottle. Once the diapers reach all the way around the bottle, begin placing a second layer into just one of the rubber bands. 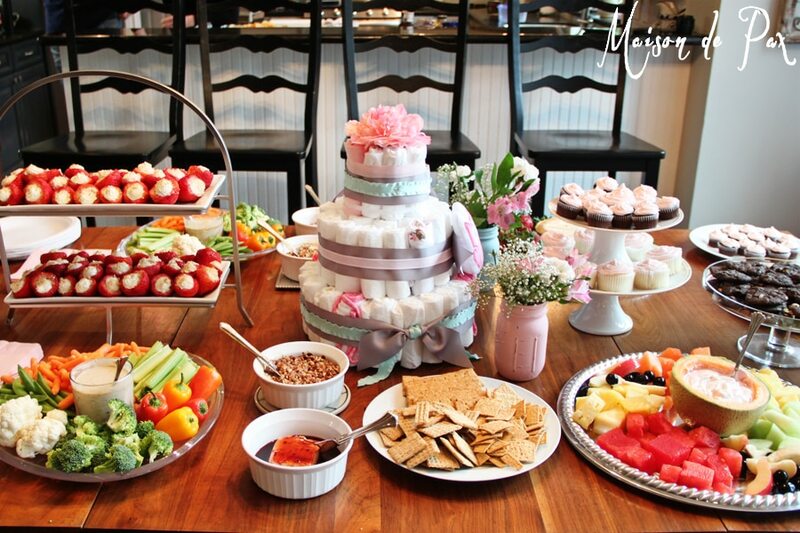 Once those diapers reach all the way around the first row of diapers (you’re still on the bottom tier of the cake, remember? But it is two rows thick), create a third row. If your rubber bands are long enough for one to go around a third row, great! I use regular office rubber bands, and they would not stretch that far, so I cut two and tied them together. No one will see the rubber bands anyway! 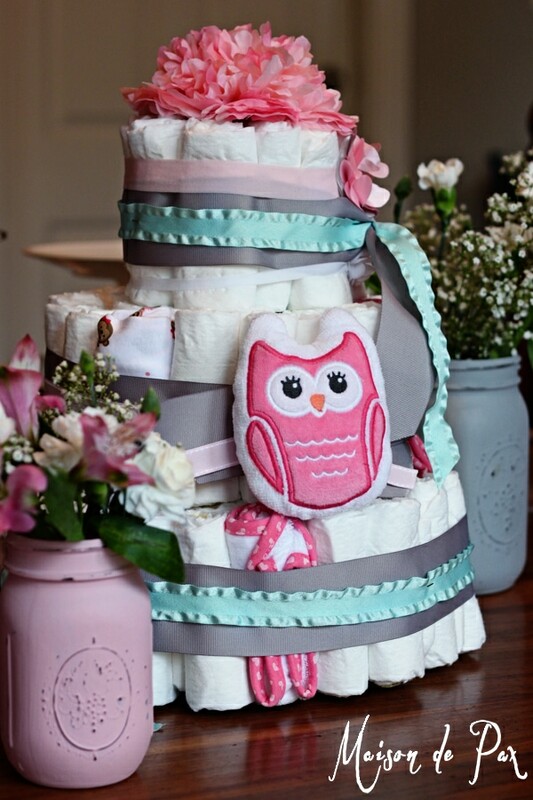 Washcloths and Onesies: If you opted to include washcloths and onesies in your diaper cake, simply replace a few of the diapers on the outermost row of any tier with a washcloth or onesie rolled to the same size as the diapers (see images above or below for visual). Tier 2: Repeat the two rubber bands, filling both with the first row around the bottle and just one with the second row around the bottle. 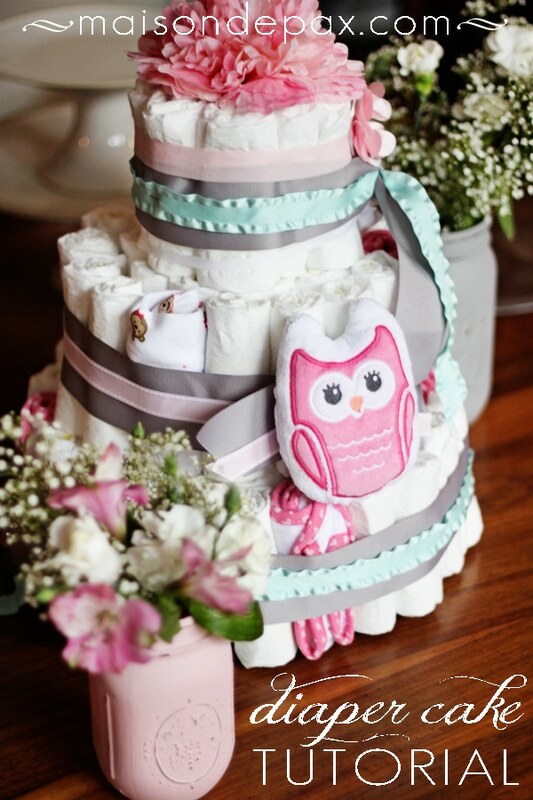 Your second tier should have two rows of diapers, all rolled to hide the top of the diaper and placed vertically against the bottle. Tier 3: This time, use just one rubber band. You only need one row of diapers on the top tier. Topper: I like to use huge silk flowers because the stem makes attaching them a snap. Simply stab the stem down into the cake alongside the bottle and cut off the stem at the bottom of the cake. If it’s a boy cake, though, and you’d prefer a little animal or something, feel free to use ribbon or rubber bands to attach it. Just make sure it covers up the hole and the top of the lotion bottle. Ribbon: Cut your ribbon to go around each tier (to cover up the rubber bands) and tie as desired. Accessories: At this point, clip on any additional accessories you have. I used a package of baby headbands to add some flowers and used the ribbon to tie on the owl wash mitt. But you only spent a few bucks beyond the gifts – very practical, basic gifts that you know the mother-to-be will need. And that, naturally, is the goal of these things: to bless those you love with all they might need to survive enjoy the beauties of motherhood. 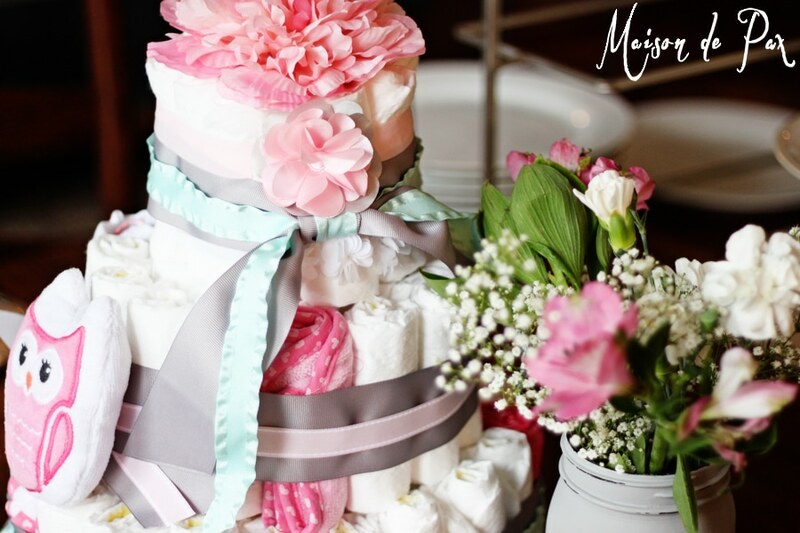 I have always thought diaper cakes were too cute and a perfect gift! But didn’t realize how easy they are to make. Thanks so much for the easy tutorial! Pinning and making for a sweet friend! 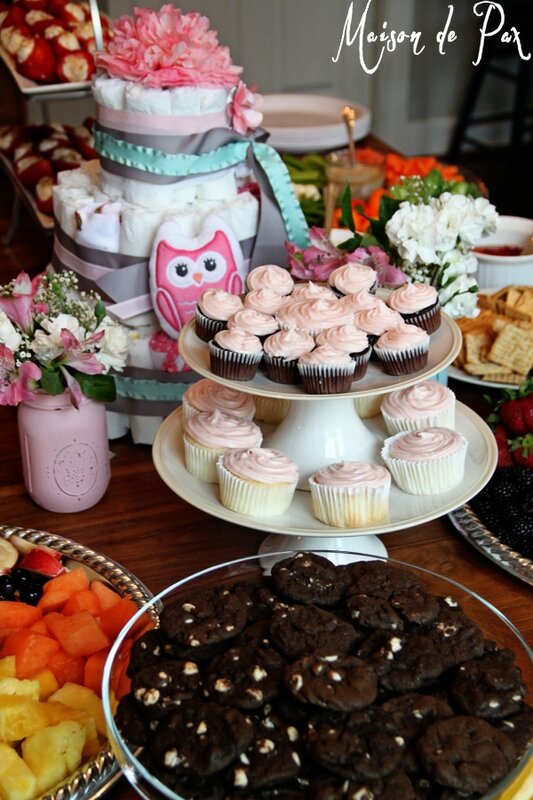 I would love for you to share your creativity at my Show-Licious Craft & Recipe Party! Join us each Saturday morning at 8:00 am EST! Thank you SO much, Kathryn! I’m so glad you like it! !